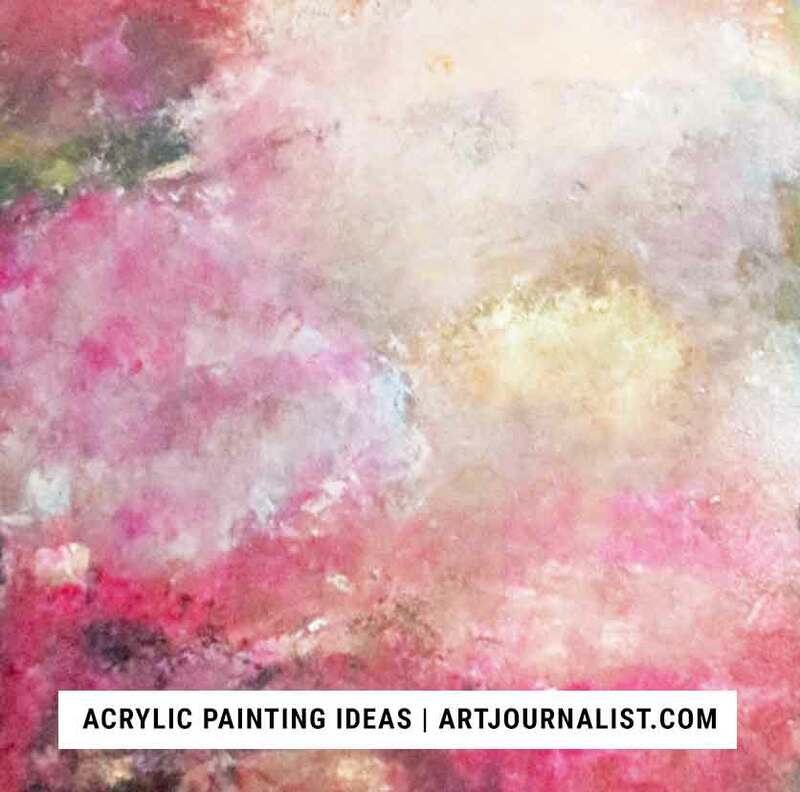 It’s no secret I love working with acrylic paint in my artwork, so today I thought I would share some fun ideas for acrylic painting techniques you can use to create interesting backgrounds in your journal pages and and artwork. There are so many different acrylic paint techniques which offer so many possibilities for creative expression! You are sure to find some ideas and inspiration here for different things you can experiment with in your creative art journals. Why acrylic paint? Acrylic paint is easy to find, easy to work with, and easy to clean up – so, yes, allow yourself to let go and have fun making a mess – that’s the best part! 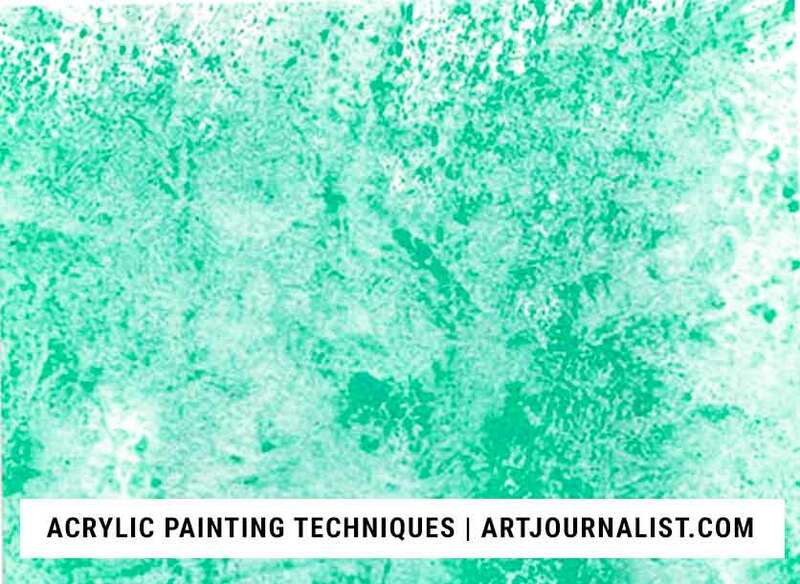 Need a Primer on Working With Acrylic Paint? If you are new to world of acrylic paint, you might want to also check out these articles on our site, as they have some good info on what to expect when you work with acrylic paint in your projects! Whether you are working in an art journal or painting on canvas, there are so many different things you can create with acrylic paint. These resources will get you started in no time. 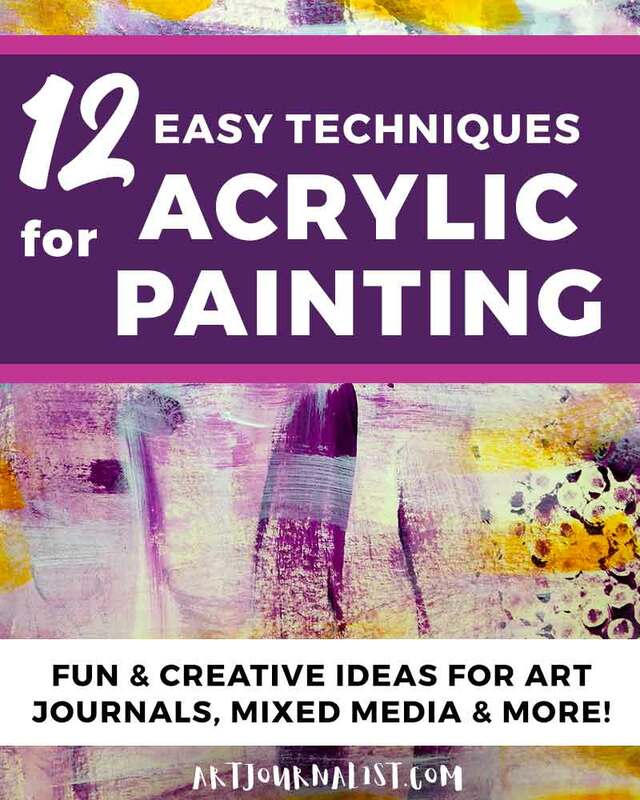 Here are 12 Fun & Easy Acrylic Paint Ideas & Techniques to Inspire Your Creativity! 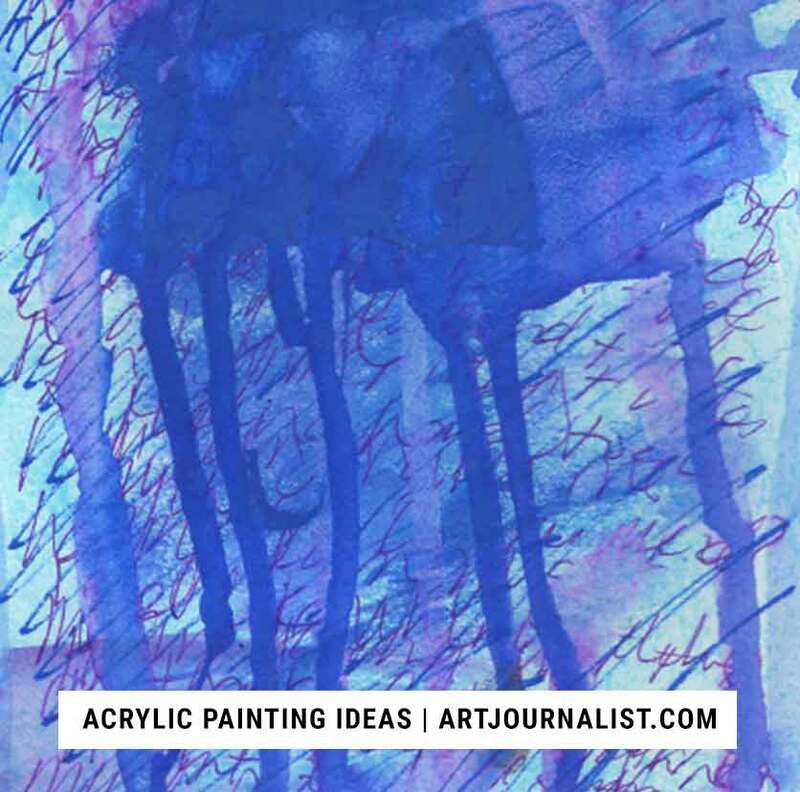 These acrylic painting ideas are fun, easy, and will definitely help inspire your creativity! Grab your journal, a blank sheet of paper, or a canvas board and have some fun! Scraped backgrounds are super easy to do with acrylic paint, and can be a lot of fun. You can quickly create multiple background pages if you are creating a journal using this technique. Here’s an example of this technique used on canvas to give you some ideas for painting with this acrylic painting method. All you need is a large flat object – I usually use old expired gift cards and credit cards and “fake credit cards” that you might get in the junk mail pile from different places. Then, I simply add a few dabs of paint and spread it around with the credit card. Easy peasy and it can really add a nice layer to use as a background. You can also use this technique to create nice straight blocks in your pages. There’s no limit for what direction you scrape – up and down, side to side – let your creativity flow! You can also use many different colors for different blending effects. 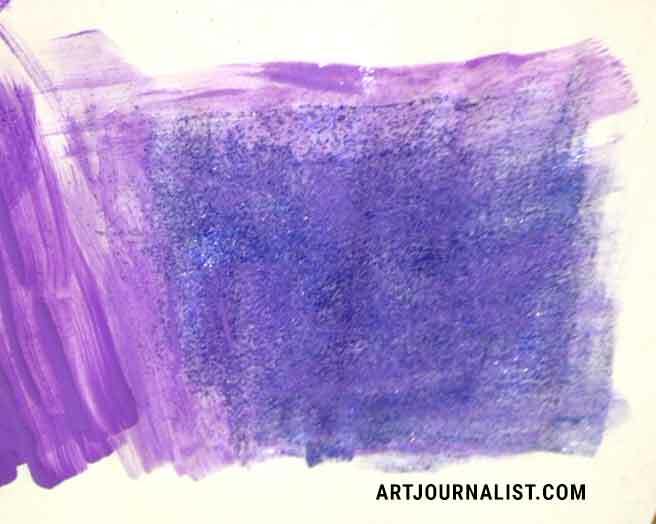 And, this is not just an acrylic painting technique to use for art journals – It also works great for covering large areas of canvas easily! In the example above, I simply used an old gift card to spread the large sections of orange, blue, and yellow on a canvas over some scribbles made with Neocolor II crayons. 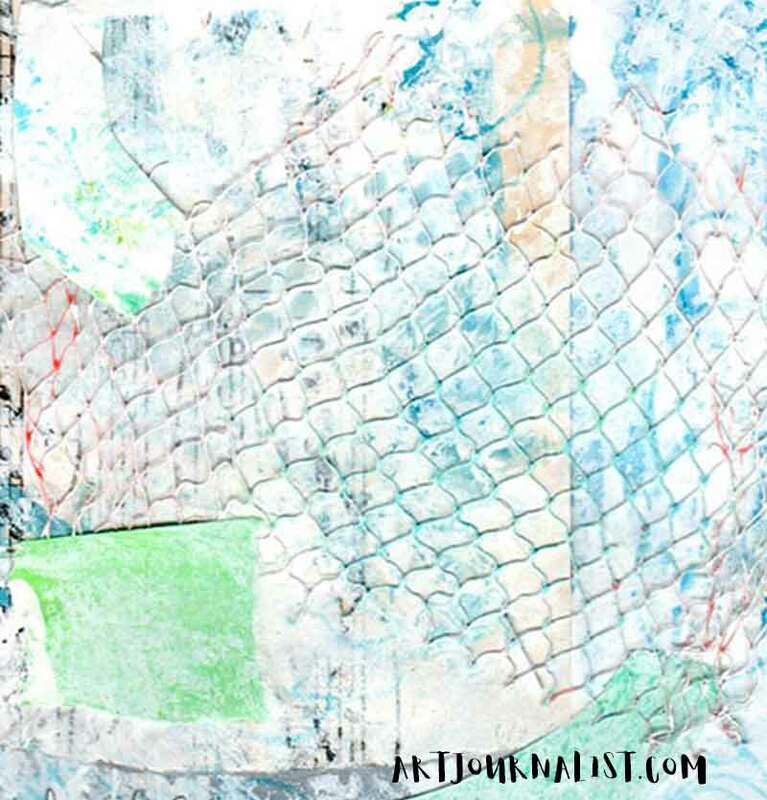 It’s a super fun way to build up lots of layers in your artwork both in your art journals and on canvas! Underpainting is a technique where you paint the first layer in one color and then after it dries go over it with another color. When the first layer of paint dries, it won’t blend with the new layer of paint, but it will instead slightly show through to the second layer. 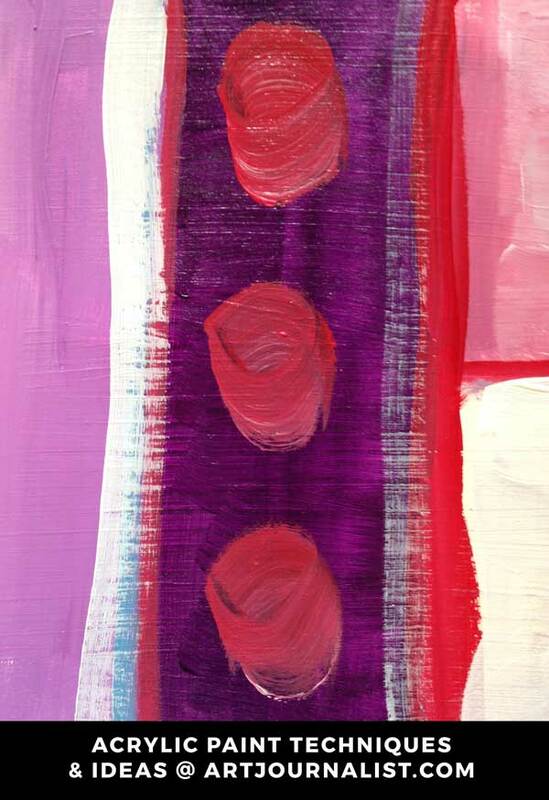 In the example shown here, I painted a large block with the color purple, and then went over it with red circles. You can see hints of the purple underneath showing through where the three red circles are in the center. For this technique, it’s helpful to use soft bodied paints such as Golden Fluid Acrylics or Liquitex Soft Body Acrylics. Of course, you can also always mix any regular heavy bodies paint with acrylic fluid matte medium to make your paints a bit more translucent as well! You can do this technique in many different ways and for a lot of different types of projects! You can definitely see a difference between the shade of the red on top of the purple and the red on top of white paint to the right! You can also do this to build up a LOT of layers, especially when painting images of scenes and objects. 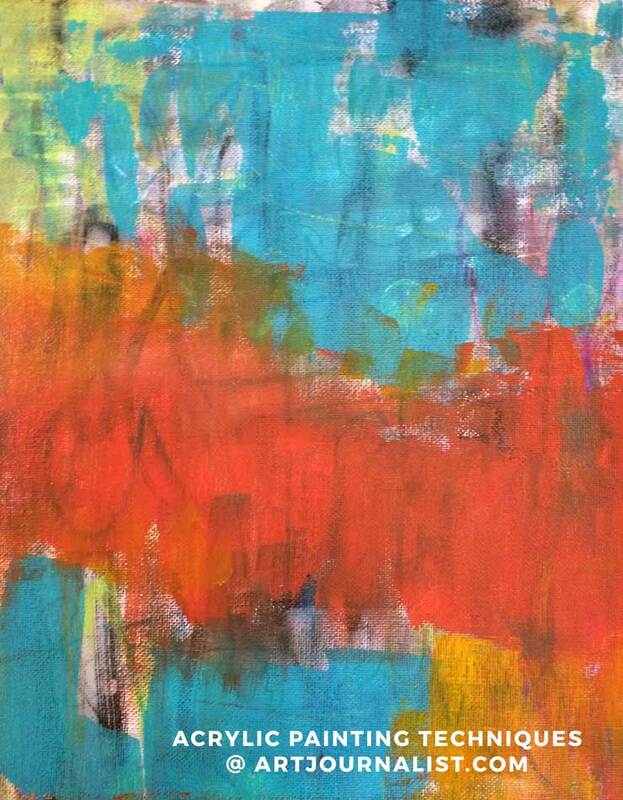 Starting with one color, allow it to dry and keep building on and adding new layers of different colors on top. The first layers will show through at varying areas to create a multi-layered effect. In the image above, you can see how many different layers of paint show through to create many different shades and colors! Acrylic paint dries pretty fast – which means you can have a lot of fun experimenting with water to create water splatters which cause the paint to lift off from the paper or canvas surface. This technique is somewhat messy, but super simple! All you will need to do is brush on a few strokes of paint – and then using your brush or fingers, splatter on a bit of water on top of the paint. Let the water droplets sit for about 3-5 minutes, and then use a dry paper towel to carefully dab the places where the water was splattered. When you lift up the paper towel, you’ll notice the water causes the paint to also lift off and this creates a neat effect of where the water used to be! So many possibilities with different ways you can use this one! Use it as a background or for when you start adding layers. Stencils can also be a lot of fun when working with acrylic paint! 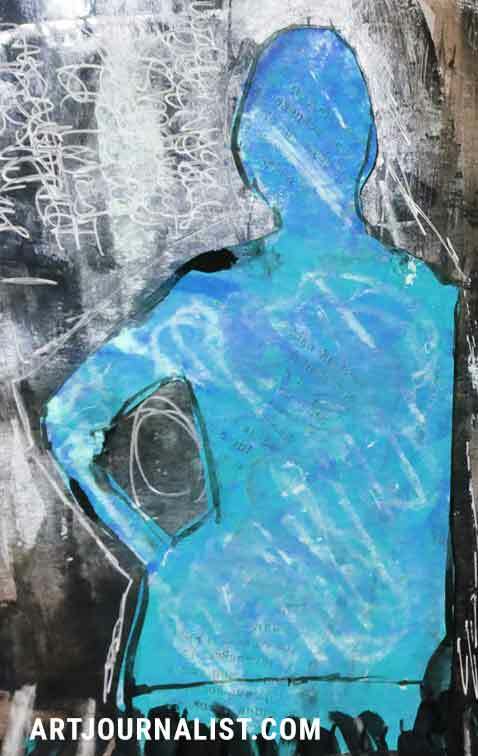 You can use stencils to create a number of different patterns and textures in your mixed media art. I find that using foam brushes help the most with getting the best coverage over stencils, but you can experiment with a number of different brushes and techniques. Another technique that can be fun is to use different types of items to make marks in your painting. You can use these items as a different style of brush stroke, or you can use them as stamps. There are a TON of things you can use for stamping into your paint. Many of them you already likely have around the house, such as lids, hardware, forks, etc. This is especially fun when combined with a gelli plate for making art prints. One of the things that is fun about using acrylic paint is it really works well with creating mixed media art! There are a lot of ways you can add texture into your art with acrylic paint! In this picture below, I repurposed a piece of netting from a bag of oranges we had to add some interesting texture to the page. 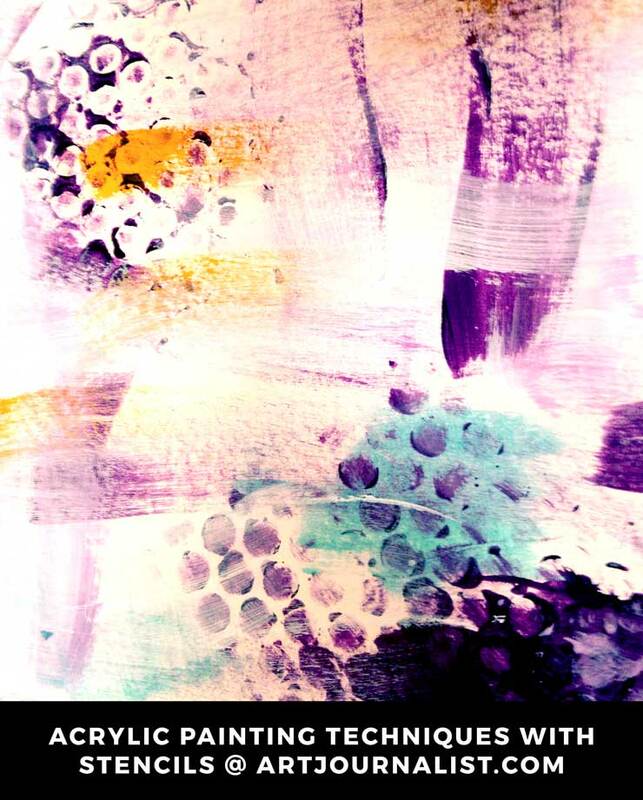 You can attach different things to add texture to your work and paint it right into your picture! This is a great way to repurpose different things from around the house. You can use tape, pieces of paper, string, ribbons, and more – all of these things can be painted over with acrylic paints! You can use glue or matte medium to help keep items attached and then paint over them – this really adds a lot of texture to your work. It can be fun to splatter and spray acrylic paint for different effects. In the past, I’ve experimented with making my own DIY acrylic spray paints, by watering down the acrylic paint and putting it in a spray bottle. It can be messy, but it is fun! The important thing is to make sure the paint is watered down enough that it won’t clog up the spray bottle nozzle. 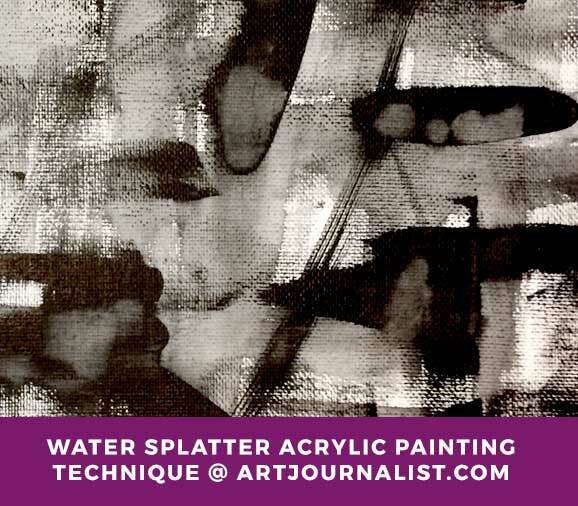 Alternatively, you can mix water into paint to dilute it and then splatter the brush to get a similar effect. This idea is simple to do – all you need is to use your favorite color of paint, mix with a bit of water, and apply it to the page. Next, just tilt the paper so the paint starts to run. If the paint is not running easily when you tilt the paper, you can add more water. In this picture above, I used this technique over some handwriting with ink. The watered down paint dripped and also created some neat smearing effects with the layer of ink below it! Another acrylic painting technique idea is to use baby wipes or paper towels to smudge the paint after it is applied. The main thing is to take some care in picking colors which will blend well. You can see here that some of the colors don’t always play nice together and can give it a muddy effect. Play around with different materials – baby wipes which are wetter will give you a much different effect than the texture created by dry paper towels. You can also try patting it or smearing it for different effects as well. A silhouette is an outline of shape of a person or object that is contrasted with the background. You can use many different shapes cut-out from paper or a picture and paint over it. For example, this silhouette of a person started out as a picture of a person I cut out from a magazine. I traced around the photo and painted it a contrasting color from the background. You can also use cut-outs of different shapes as a layer mask. Basically you would put down a cut-out shape of any object over your first layer of paint and then add a second layer of paint all around it. When you lift the mask, the layer below will appear to be a different style than everything around it. You can try this with all sorts of shapes – squares, circles, animal silhouettes and more! Did you know they make several acrylic based glitter paints? Oh yes, they do! You can find acrylic glitter paint at most craft stores. I used Folk Art Extreme Glitter Paint in the example shown below. It comes in many colors, or you can always use it on top of another color! 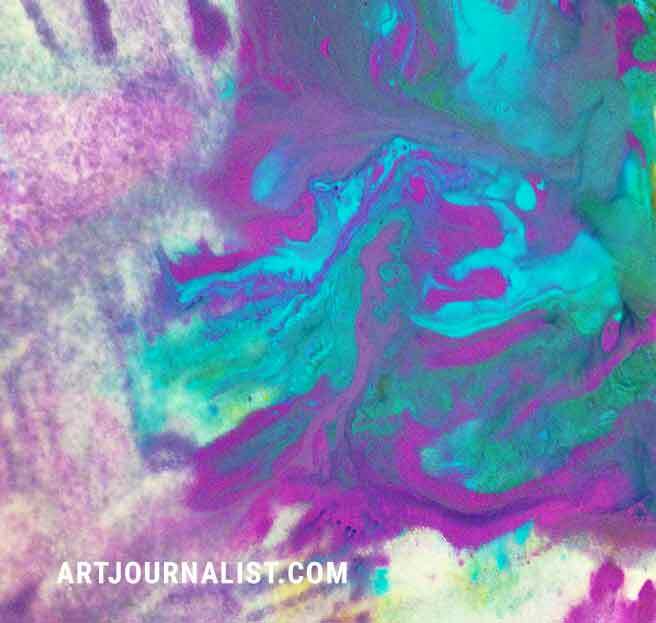 This is a messy but fun marbling effect you can do when you mix water, rubbing alcohol, and acrylic paint together. To get this effect, I first pour on two contrasting colors of acrylic paint next to each other on a piece of paper. Then I add a lot of water, without mixing the paints, and then I add rubbing alcohol. Using the tip of the paint brush, I then swirl it around to create different marbled patterns. 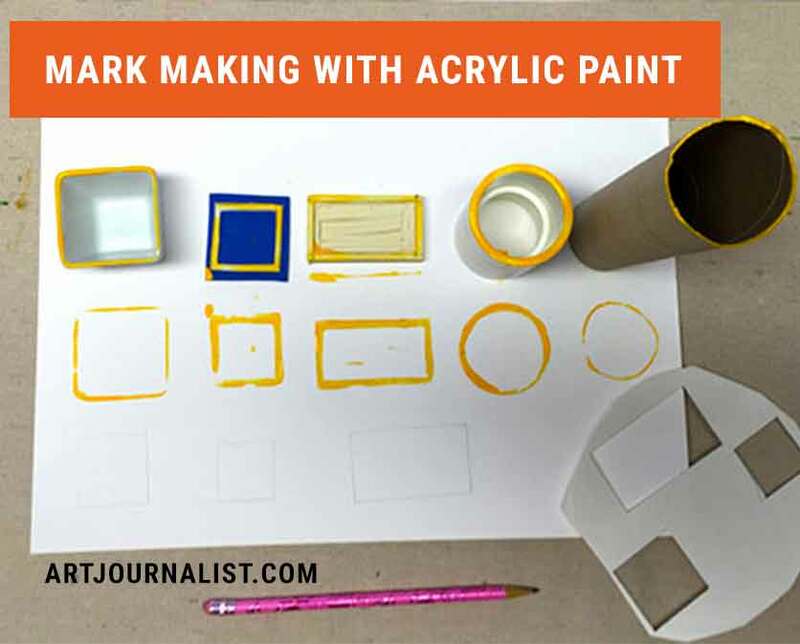 This technique for acrylic paint takes some experimentation – but that’s part of the fun, right? Which of these Acrylic Painting Technique Ideas Have You Tried? Have you tried any of these acrylic painting techniques before? Do you have any acrylic painting ideas we should experiment with? Share your thoughts and experiences in the comments below! I have experimented with several not knowing if this was proper or not but have had a lot of fun.